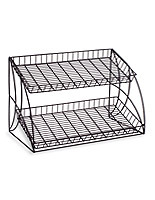 Features (3) open design wire trays for easy customer shopping. Tiered design for displaying a variety of items while saving space. Powder-coated black finish to complement any retail environment. Built from metal to withstand everyday use. This retail display, merchandising rack is perfect for displaying your impulse items in a small amount of space. 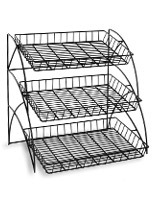 A counter display, tiered stand includes three open-space wire shelves. Keep everyday favorites within reach without taking up precious counter space by using a merchandising rack. Retailers can use this wire display to offer candies, toiletries or other small items. Displayed at an angle, this merchandising rack makes it easy for customers to view the entire selection. 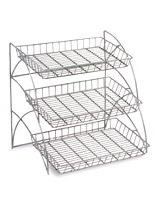 Place this three tiered display at a bakery counter to entice shoppers with fresh baked goods. 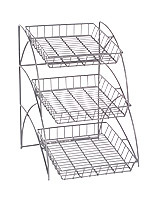 This merchandising rack can help businesses to increase sales and profits. We strongly recommend our customers place the display at cash register areas to attract impulse buys. 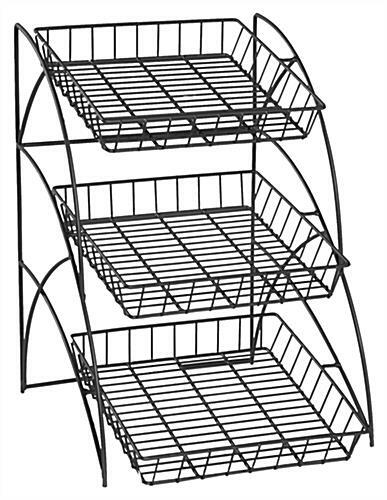 This 3-tier merchandising rack allows users to display many items on one single display while saving space for other displays. 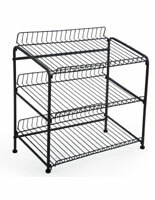 Constructed from wire with a black powder-coated finish, this wire stand is designed for many years of use. 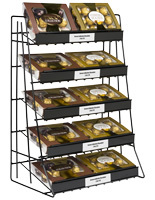 A merchandising rack, like snack holders and counter displays is a multi-purpose unit that is great for any business. This metal stand is durable and built to withstand the typical wear and tear of any retail environment. This versatile merchandising rack can be used in almost any setting, ranging from restaurants to busy supermarkets. Buy this wire display before 3PM and the unit ships today! Use the merchandising rack to attract customers to buy more! 14.8" x 22.5" x 17.8"
Very impressed with this item. This is a nice Wire Rack and does the job it is supposed to do.